but not a sago. 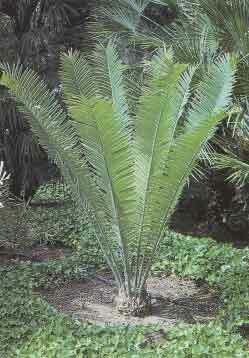 I have seen these types of plams or cycads how ever you spell it around my area but do not know what they are? Can any one help me out with this. The branches of the palms are a bit larger and more stiff so to speak. Upload some pictures if you can so I dont have to go hunting for them. THanks Dont mean to sound bossy just in a hurry. You are very right they are very very slow growing. Be sure where you place them not to plant other fast growing plants or palms because then you will have an unbalance. We have handled Coonties for 17 Years. They are our only Plant. Over 7,000,000 in stock from 1 Gal to 45 Gallon. We ship bare root or potted. We also have seeds available. We service Interior Plant Leasers and Decorators. We also are working with Disney/Reedy Creek, City of Miami, City of Lakeland, many County Governments and FDOT. Zamia Floridana are well suited for Indoor use and require minimal Sunlight to survive. traces of scale because the Organic Mixture contains Coffee Grounds which discourage the growth of scale. Please contact us for any info or to order. I think i might add some to my yard. They are very tropical looking and since they are slow growing they will just be perfect by the house. Awesome prices. I will be in touch.